Good morning. 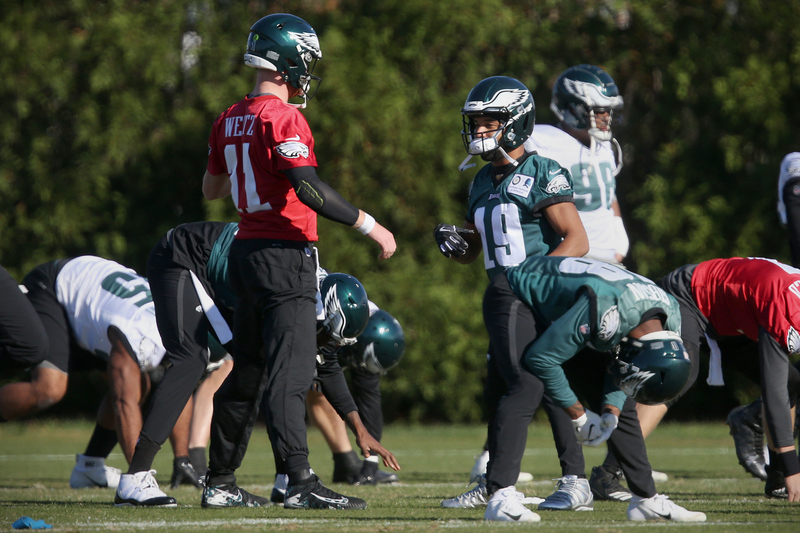 The Eagles practice at 11:50 a.m. today for their final session before Sunday’s game against the Dallas Cowboys. Doug Pederson has his news conference at 10:30 a.m. This is a Friday edition of the Early Birds newsletter. If your friends haven’t subscribed, it’s free to sign up here to receive the newsletter in your inbox. I want to know what you think, what we should add, and what you want to read, so send me feedback by email or on Twitter @ZBerm. Thank you for reading. Eagles’ Lane Johnson, left, looks to block the Cowboys’ Sean Lee as the Philadelphia Eagles play the Dallas Cowboys in Philadelphia, PA on December 31, 2017. It’s admirable that Lane Johnson appears committed to playing through a knee injury, but the assignment against defensive end DeMarcus Lawrence would be a challenge even if Johnson played at full health. The Eagles must hope there’s not a decline in Johnson’s production while playing through the injury, because Lawrence is one of the NFL’s top pass rushers. He had 14.5 sacks and four forced fumbles last season and he has 6.5 sacks and a forced fumble this season. Carson Wentz has fumbled in every game this season and Lawrence will go for the ball. Johnson must keep him away from Wentz. This matchup will be worth watching throughout the game. If Johnson must exit, Halapoulivaati Vaitai would be the next man up at right tackle. All Eagles fans will focus on No. 19. Golden Tate is the Eagles’ marquee midseason addition, and the Eagles will use him quickly and often on Sunday. Tate might have a limited menu of plays, but it will be enough for him to play a key role in the offense. There’s been much discussed this week about the short-passing game, and it’s an important point to remember. The Eagles can find Tate on short passes that replace the run in certain situations, and they’ll hope his run-after-the-catch ability can get them into more manageable second and third downs. Tate excelled against Dallas earlier this season (eight catches, 132 yards, two touchdowns). It will be hard to replicate that performance, but you’ll notice he’s out there on Sunday. The Cowboys have one of the NFL’s best defenses, although the Eagles will count on Carson Wentz and a deep group of targets to move the ball on Sunday. Will the Cowboys commit to the run? You read it every week: The Eagles want to stop the run and make teams one-dimensional. And each week, teams seem willing to play into that script. The Eagles have the second-ranked run defense, but they’ve also seen the fewest rush attempts in the NFL. The team with the second-fewest rush attempts against them is 20 attempts behind. It’s clear that opponents feel the Eagles are more vulnerable against the pass, but when looking at the Dallas offense, their best bet of winning is by pounding the ball with Ezekiel Elliott. If they try to air it out against the Eagles, they’re taking the ball out of their best offensive player’s hands. Elliott averages 18.6 rush attempts per game and 4. 6yards per rush. It would behoove them to feed him the ball. The Eagles’ defensive game plan will be built around stopping him, though, forcing Dak Prescott to try to beat them. The Eagles are expected to play without cornerbacks Jalen Mills and Sidney Jones, forcing the them to make adjustments in the secondary. Rasul Douglas will start as the outside cornerback, which might cause some parties among Eagles fans eager to see Douglas on the field. With Jones out and Dexter McDougle sent packing, the Eagles need a new slot cornerback. They can move Avonte Maddox from safety to slot and use Corey Graham at safety, but don’t be surprised if they turn to Cre’von LeBlanc even though he’s only been with the team for a few days. Maddox is best as the deep safety right now and the Eagles like Graham in the third safety role, which allows them free Malcolm Jenkins to roam. But LeBlanc joined the team this week, so Jim Schwartz must be confident that he can handle such an important responsibility – especially because Cole Beasley is a big part of Dallas’ game plan. The cornerbacks need a good performance against Amari Cooper, who is the Cowboys’ new top option and who beat the Eagles for a deep touchdown while with Oakland last season. I’d use Ronald Darby to follow Cooper around the field. The Eagles expected Darren Sproles to return this week. That was part of the reason why they waived DeAndre Carter. When Sproles reinjured his hamstring at Wednesday’s practice, it didn’t just affect the Eagles’ running back rotation. It also forces them to scramble at punt returner. Corey Clement played that role earlier this season and is listed as the top returner on the unofficial depth chart, although he was inconsistent handling punts. The Eagles could also turn to Golden Tate or even Nelson Agholor. Even if they don’t have a dynamic player back there, they need to make sure there are clean catches. The Eagles don’t want to be give up possessions because of muffed punts. Eagles cornerback Ronald Darby stretches his arms after catching the football during practice at the London Irish training ground in Southwest London on Friday, October 26, 2018. Why waste a roster position on sproles if he cannot play ? The Eagles didn’t think Darren Sproles‘ injury would last as long as it has, and then a setback just adds another obstacle. The Eagles appear to have mismanaged Sproles’ recovery. In hindsight, it would have made sense to put him on injured reserve and preserve the roster spot, and then activate him when they were convinced he was fully healthy. Injuries can be tricky, but the Eagles could have handled this better from a roster-management and injury-management perspective. Chances that Josh Adams is the Eagles #1 back in 2019? I don’t think it will happen, but I wouldn’t rule it out. Josh Adams will have an opportunity this season to show he should be their top running back. He played like it in their last game and an average of 5.4 yards per rush is encouraging. He was a lead back for Notre Dame and showed he can handle it. I think Adams’ best hope might be having a role in a committee and I can see the Eagles addressing running back this offseason, but Adams has a few months to try to convince them otherwise. So the honeymoon didn’t last long, huh? The answer to your question is not anytime soon. The Eagles won the Super Bowl! Read that last sentence again. Plus, this season is not a disaster. They’re 4-4 and I think they make the playoffs. The offense is underachieving and the team should be better, but it’s not grounds to even discuss a dismissal. Doug Pederson has better job security than almost any coach in the NFL right now, as he should.